A woman died and more than 100 other people were hurt when an NJ Transit train crashed into the station in Hoboken at the height of Thursday's morning rush, leaving twisted piles of metal and cables and causing part of the highly trafficked terminal to collapse. Fabiola Bittar de Kroon, 34, was the only person killed when train No. 1614 barreled through a platform at Hoboken Terminal at about 8:45 a.m. De Kroon, a Hoboken resident who was standing on the platform, leaves behind a child and husband. Preliminary reports suggest the crash was either accidental or caused by operator error, according to five law enforcement officials. They stressed it was early in the investigation, though. Three sources familiar with the incident identified the train operator as Tommy Gallagher, whose father earlier told NBC 4 New York that his son was a long-time NJ Transit employee. One source said a review of Gallagher's background thus far has not thrown up any red flags. 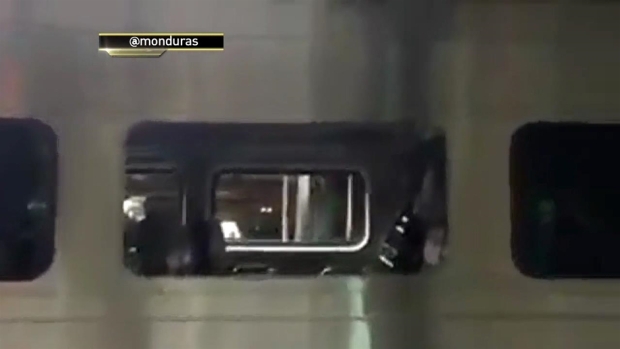 People pulled concrete off bleeding victims, and passengers crawled out of windows crying and screaming, after the arriving train smashed through a barrier at the end of its track and ground to a halt in a covered waiting area. 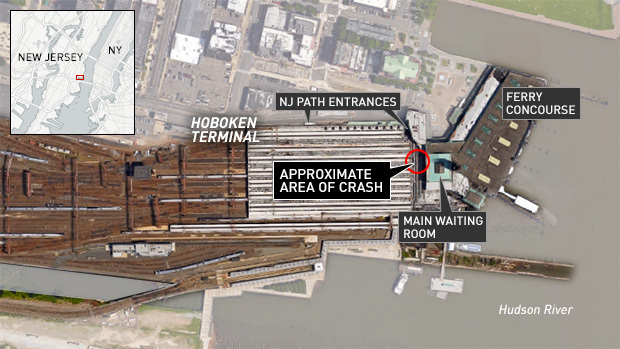 NTSB Vice Chairwoman T. Bella Dinh-Zarr says that the canopy of the more than 100-year-old train station building in Hoboken is resting on top of the car that sped off the tracks and the NTSB was waiting until it's safe to go into that area. She says water has been leaking in all day and there may also be asbestos contamination because of the age of the building. "We've seen that it's very unsafe in there. The scene is quite chaotic," she said. "We are planning on going into the locomotive because it's in a safe area." On Friday morning, investigators confirmed they pulled one of the black box event recorders from the train. The device contains information on the train's speed and braking. It wasn't yet safe enough for investigators to extract the second recorder from the engineers's compartment because of the collapsed roof and possibility of asbestos in the building, investigators said. Gov. Chris Christie, who visited the site along with Gov. 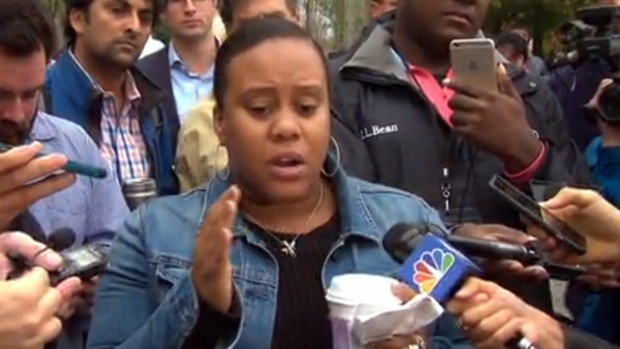 Andrew Cuomo, told NBC 4 New York over the phone that "the destruction was really incredible." "You can tell that the train was moving at a very high rate of speed when it came in there," he said. Gov. Chris Christie speaks to NBC 4 about his immediate impressions of the damage to Hoboken Terminal after a NJ Transit train crashed there, the latest on the investigation and what commuters can expect. Photos showed emergency crews standing on piles of rubble, peering into the mangled wreckage of the train in a frantic search for survivors. Early correspondence on emergency radio conveyed the gravity of the situation. "I have heavy structural damage. I have people trapped on the train. We're gonna need support. Major major casualties," a first responder was heard saying on Jersey City fire radio. "We need a command post set up and we're going to need extracation tools on the train. We have a train into a structure." 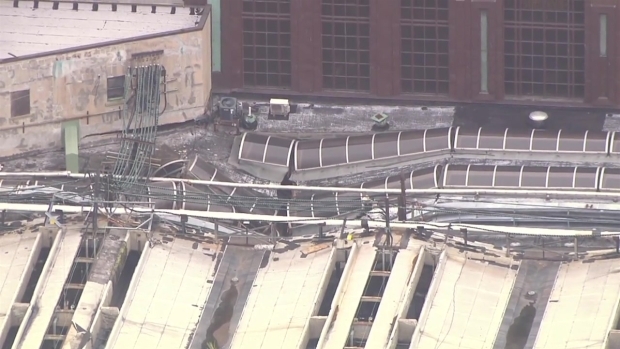 Helicopter footage from over the scene of a train crash at Hoboken Terminal. Jersey City Medical Center said it took in 66 patients from the crash, and 53 of them have been released after being treated in a makeshift triage center in the hospital cafeteria. Thirteen patients remain in the hospital, but they're not in critical condition, according to a spokesman. Hoboken University Medical Center said it received 23 patients, including one walk-in; all but seven were released by late afternoon, according to a hospital spokesman. At least one person was admitted to hospital -- that patient had a fracture -- but all patients were in stable condition. The minor injuries included bumps, bruises and complaints of shortness of breath and chest pain. Christie said the total injured stood at 114 people, including those with minor wounds requiring only a bandage. Gallagher was treated and released from a hospital after sustaining serious injuries in the crash. Christie said he was cooperating with authorities. William Blaine, a freight-train company engineer who was in the station when the train crashed and ran to help, said he saw the engineer slumped over the controls. 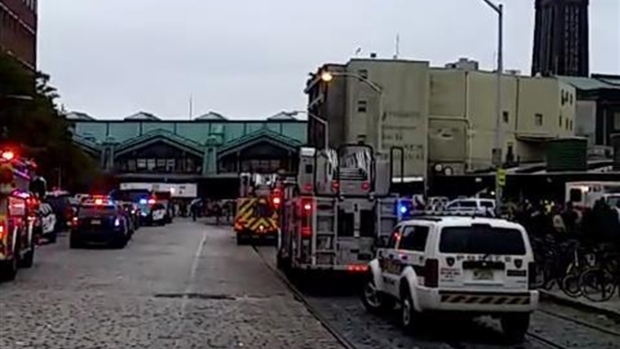 Close-up video shows the train that crashed in to Hoboken Terminal Thursday morning. Jamie Weatherhead-Sal, a passenger in the first car of the train, told NBC 4 New York the train "just felt like it never stopped. It didn't slow down. It didn't brake." Jamie Weatherhead-Sal, a passenger aboard the NJ Transit train that plowed into Hoboken Terminal, recounts the harrowing experience. Others said the train seemed to be moving faster than usual as it entered the station, but they didn't think much of it -- until the impact. Tearful passengers described people screaming, bloodied and trapped in the first car. Several people who were on the train tweeted they felt "lucky to be alive." The train was not equipped with positive train control, a technology designed to slow speeding trains that all U.S. railroads were ordered by federal officials to install. The work has gone more slowly than expected. The deadline has been repeatedly extended and is now Dec. 31, 2018. Bob Chipkevich, who formerly headed the National Transportation Safety Board's train crash investigations section, says the agency will be looking at whether the train was exceeding speed limits, both when it was approaching the station and when it entered the station area. Gov. Cuomo said Thursday the train was "obviously" going at a high rate of speed. Passenger Bhagyesh Shah said he boarded the train at Secaucus. He said he normally stands near the window, but stood in the back of the train Thursday. "The next thing I know, we are plowing through the platform," Shah said. "It was for a couple seconds, but it felt like an eternity." NBC staffer Aracely Hillebrecht, 32, said she was standing on the platform when the train barreled into the terminal. "I heard screeching and we saw the train and someone yelled, 'Run!" Hillebrecht said. "We heard the train crash and heard the sound of water as the roof collapsed. People were scrambling and running away." Hillebrecht said she saw people who were "really hurt" and "some couldn't walk." More than 100,000 people use NJ Transit trains to commute from New Jersey into New York City daily. Hoboken, which is NJ Transit's fifth-busiest station with 15,000 boardings per weekday, is the final stop for several train lines and a transfer point for many commuters on their way to New York City. "The good news is that the PATH station that goes from Hoboken, the structural integrity has been checked by engineers and it is fine, and so we have people being able to use the train back and forth," Christie told NBC 4. 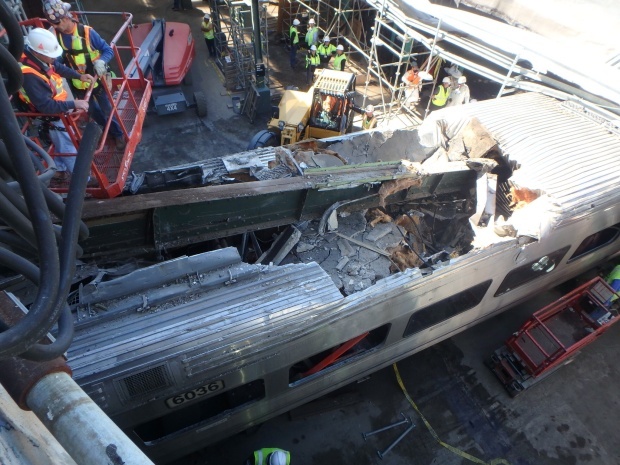 But "upstairs on the New Jersey Transit area, some significant damage was done." The crash brought wires down onto the energized tracks, so power had to be shut off to the area, Christie said. Trains cannot come in and out onto those tracks until power is restored, "and we have some rebuilding to do there." Engineers from both the Port Authority and NJ Transit will be at the station all night inspecting and devising a plan on how to get NJ Transit up and running again. Christie is expected to offer an update on that Friday morning. In the meantime, there are expanded shuttle, bus and ferry services that are cross-honoring. The Federal Railroad Administration says it sent investigators to the scene. The NTSB is also responding, and investigators on the scene were donning masks because of asbestos concerns, according to a source close to the investigations. In order to restore train service, a wall of some sort will be built to segregate several usable tracks from the worst of the damage, according to the source. It's not yet clear how quickly the wall will be built or when the train service will be restored. Asked about positive train control, a spokeswoman said, "We know that it can protect against accidents and whether it was involved in this accident is something we're looking at carefully." The NTSB spokeswoman also said it would look at past accident history at the station. A crash at the same station on a different train line injured more than 30 people in 2011. The PATH commuter train crashed into bumpers at the end of the tracks on a Sunday morning. In that case, the NTSB determined the engineer likely failed to control the speed of the train. The agency said a positive train control system would have prevented the collision. Unlike the NJ Transit tracks at the station, the PATH tracks do not terminate facing the terminal. The Hoboken Terminal, which was built in 1907 and is listed on the National Register of Historic Places, has undergone waves of restoration, including a major project launched by NJ Transit in April 2004 that largely restored the building to its original condition.